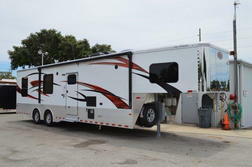 Enclosed trailers intended to both haul vehicles such as race cars, motorcycles, ATVs, etc to races and shows while also providing living spaces. This trailer is in Indiana! Ready to Go!! 2-7000# axles! Ready to go Today!